Scientists have revealed the first ever image of a black hole. The picture is the result of a global collaboration in which scientists linked together telescopes virtually to create one, huge, Earth-sized telescope. The observation period, in April 2017, was followed by almost two years of data processing—and the resulting image has now been made public. To mark the occasion, the Smithsonian Channel will be showing an hour-long documentary about the Event Horizon Telescope project. 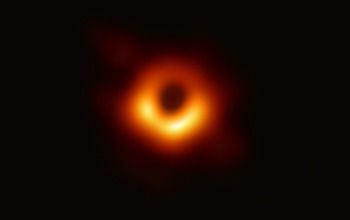 Black Hole Hunters follows the scientific team behind the EHT, showing the journey that would culminate in the groundbreaking announcement. It airs on Friday, April 12 at 9 PM ET. It has been predicted that the extreme gravity around a supermassive black hole would cause the light from this gas to bend around into a ring of light, that we call the black hole’s “shadow.” This ring is a signature of the black hole’s event horizon. Einstein’s equations of general relativity predict the size and shape of this ring. So seeing a picture of a black hole would not only be spectacular, it would also help to verify if these equations hold in the extreme conditions around a black hole, where they are most likely to break down. As one of my fellow colleagues on the project, Jonathan Weintroub, recounts: “The technique of Very Long Baseline Interferometry (VLBI) was developed more than 50 years ago at longer wavelengths. In the mid 90s to early 2000s receiver and recording technology enabled the first one millimeter wavelength VLBI, including a pioneering detection on SgrA* [*Sagittarius A, the black hole at the center of the Milky Way] between France and Spain (373 miles). With observing at these short wavelengths now feasible a small, and modestly funded group noticed that a one millimeter wavelength VLBI telescope array that spans the Earth could resolve the never-before seen shadow of the largest black holes as seen from Earth. If Einstein was right, we expected to see a ring of light caused by the gravitational lensing of gas surrounding the black hole. This spinning gas would be Doppler boosted so that the ring would appear brighter in the region where gas is moving towards us. If General Relativity broke down at the black hole’s boundary, we might see very different ring sizes or shapes, or no ring at all. Although it was our best guess to see this perfect ring, I was in total disbelief. We had developed and tested our algorithms for years on data we thought would mimic that of the Event Horizon Telescope, but still there are always surprises in data. Pressing ‘GO’ on a computer program I had written and immediately seeing a ring come into focus for the first time was amazing and exhilarating. We had prepared for years, but even so it was too easy! It was an unforgettable moment.